Blast the Internet, and all other ways of getting recipes. 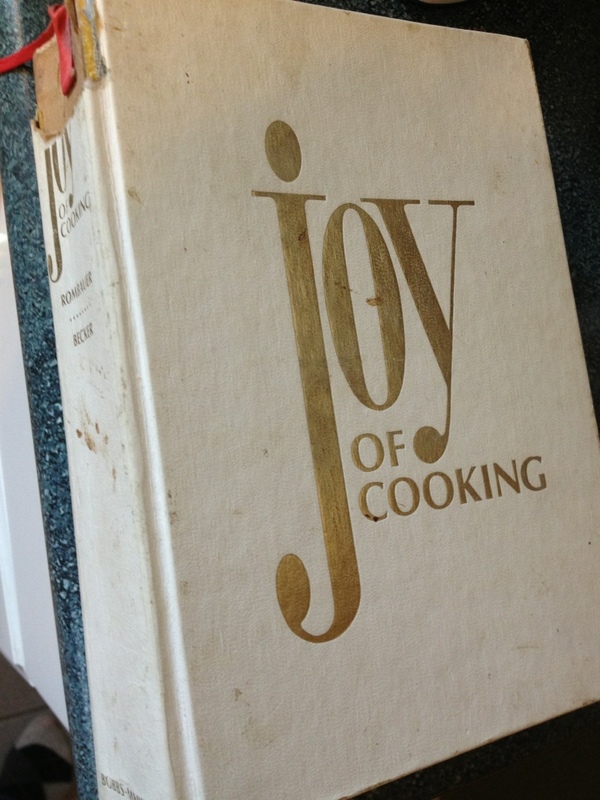 This is still my go-to resource for the best of cooking and baking. Have a yummy day!! If you read my Jude The Foodie column in Below The Falls or on JudeTheFoodie.com (you are likely already here) it would be great if you would “LIKE” me on Facebook. The thing I love about the Facebook platform is that we can more easily talk to each other. I get a lot of ideas from my Facebook friends so join the crowd – everybody’s doing it! 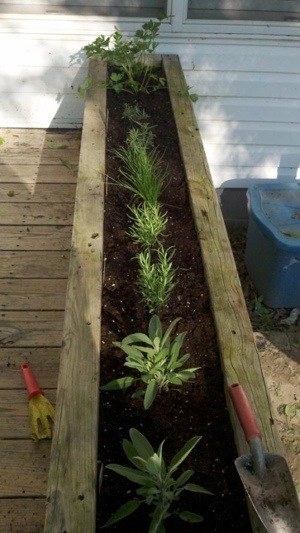 UPDATE: It is not too late to plant an herb garden. This column was originally published one year ago. The picture above is how it looks one year later! I have a friend who is a native of Southern California and lives in a beautiful home with a view of canyons and a peak at the Pacific Ocean. One morning, just after the sprinklers did their thing, I walked through the sliding glass door to the backyard and smelled a fresh scent of rosemary. It was as if someone was cooking herb potatoes right there in the backyard. Combine the stunning view with the savory smell and I wanted to freeze that piece of time forever. I soon realized the three foot wide bushes were rosemary. The stems of her plants are so hardy she can cut them and use them as skewers for grilling. Imagine infusing meat and vegetables this way. Yum! 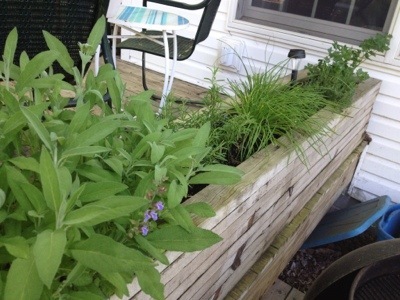 This year I am planting some herbs in a long box on my deck. It gets sun from the east. It truly is an experiment because I think there may not be enough sun. The beauty of plants is that for a very small investment you can get a big bang. If they do not make it, it’s not like losing a tree. Along with Rosemary, I planted Italian flat leaf Parsley for everyday cooking. It has seemingly doubled already and I only put them in yesterday. I planted Sage because not only do I love the celery green color, I love using it in poultry dishes and as a surprise flavor in lemonade. Try adding some sage to your simple syrup (water and sugar boiled until thick) for a delicious surprise. Keep a few sprigs as a mystery garnish. Tarragon is planted next to the parsley. I use this hint of licorice flavored herb in sauces and stews. Tarragon is the star of Béarnaise sauce. Sometimes I just use it as a pass through. I will make a sauce using whole sprigs of tarragon and removing them before serving. In the middle are garlic chives. I have never used it before but not only did I like the shape and color next to the tarragon and rosemary, when I pinched a bit with my fingers and rubbed the essential oil I got an aroma which made me hungry. There is a distinct garlic tone. I think I will use this in a sauté of vegetables or as part of a marinade for flank steak. Here is a current look at the garden. The tarragon didn’t make it so this year I dropped a German Thyme in its place. It smells really good and I’m excited to use it in sauce and for grilling. Best of the Road…stay tuned! 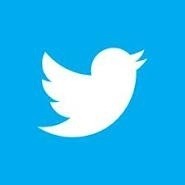 When You Tweet With Me, You Tweet With Me! I think of this every Friday when I copy my followers that week from my Excel spreadsheet to my word document, that I spend a lot of time trying to be “social” with social media. I know what you are thinking…Excel spreadsheet…Word document…she’s geek of the week. I just don’t get this fully automated social media nonsense. It really seems like an oxymoron to me – how do you automate something which is supposed to be about social interaction? That doesn’t sound very social to me! I had someone reach out to me on my www.MidMajorMom.WordPress.com blog yesterday asking me about what I thought about adding personal stuff on her “pro” Twitter account. Please follow @ldelmonte – she is an interesting lady and learning about all of this social media etiquette. I told her I really did not enjoy Twitter until I spent more time doing @mentions rather than just Tweeting my ideas. I also began enjoying it more when I took the time to read other people’s blogs and visit their websites. It helped me know whether I wanted them in my timeline and I always get great pleasure ReTweeting someone’s Tweet if I think my followers will enjoy it as much as I do. You can also over-do ReTweeting, in my opinion. It is a lot like forwarding e-mails. I stopped using one of my e-mail accounts because I have a person who ONLY sends me forwarded e-mails (who hasn’t read the one about the dollar coins not having “In God We Trust” on it by now? It does, by the way, on the side). How many in this room delete e-mails whose subject line starts with FWD:? Take time to tell me why you like the Tweet and you engage in “social” media. I vet my followers and use thought when I follow someone. I take pride in the fact that I follow only 17 people/associations that do not follow me. I take pride in the fact that I am on a lot of lists (one list for every 15 followers…not bad at all). I take pride that I personally thank each follower who took the time to follow me that week. Anyone who knows me knows I am a numbers geek. I count everything…the stairs (twelve from my second floor to the first then one more), cars ahead of me in the toll line, people at a boardroom table wearing school colors, and how many wheels of parmesan cheese were in the aging vault in Parma, Italy (over 26,000 valued at over $1.7 million). I have been Tweeting a lot lately about how important I think it is to read the Tweets of a follower before making the decision to follow them. Being followed is a privilege, not a right. In March I revived my original Twitter account @JudeCaserta and decided to keep track of my followers. Along with doing this I paid careful attention to the Tweets of folks before I would follow back. Over time, there was one relatively sure fire way to know if an account is spam without reading too many Tweets. Take a look at the ratio of total followers to number of lists they appear on. For example, just a few hours ago I was followed by someone who has 1,407 followers and is following 1,548. Not bad, actually. His problem is that he is listed only 6 times and one of the lists he is on is actually called spammers! Dude is listed 1 time for every 234 followers. Not a good addition to your timeline. Mine is a reasonably good 17. I have 734 followers and appear on 42 lists (none of which say spam or imply spam!). I was followed yesterday by a woman who is followed by 5,605 people and is on 393 lists – so that’s about a 14 (I think that’s great!). One of my favorite Tweeps has 764 followers and is on 116 lists for a ratio of about 6. He is a superstar! So, for a quick way to vet your followers, check the number of lists they appear on to the number of followers. A quick block never hurt anyone!